Corneille E.N. Ewango grew up in the western Democratic Republic of the Congo (DRC). From the age of 14 he was collecting elephant tusks and meat poached by family members. By the age of 17, Mr. Ewango also was a poacher as a means to fund his studies. He wanted to become a medical doctor to bring health care to his village that lacked health services, but after his application to study medicine was rejected three times he decided to study biology at the University of Kisangani. While at university he interned with the Wildlife Conservation Society. Within a few years, he had become passionate about botany and conservation. In 1995 Mr. Ewango received a Bachelor of Science degree and was employed as botanist and herbarium curator by the Centre de Formation et de Recherche en Conservation Forestière (CEFRECOF), adjacent to the DRC’s Ituri Forest, known for its biodiversity. By 1996 the DRC was experiencing civil war. At this time Mr. Ewango was in charge of the Okapi Faunal Reserve’s botany program. Although many staff members fled during the war, Mr. Ewango remained and protected the reserve’s plants, animals, and rare herbarium collection from soldiers and military officials engaged in illegal, anti-environmental activities by convincing them that having an intact protected area would benefit them in the long term in the eyes of world. As the war dragged on for years, at one point, fearing for his life, Mr. Ewango hid in the forest where with the help of locals, he managed to keep fourteen okapi from the Ipulu Zoo alive. While in the forest Mr. Ewango engaged in research and made many discoveries, including identifying at least 600 new tree species and 270 new species of lianas (tropical vines). Due in part to Mr. Ewango’s success at expelling poachers and miners, the Okapi Reserve remained intact through the end of the civil war in 2002. In recognition of his tremendous service to the reserve, Mr. Ewango’s international colleagues found a way for him to continue his studies. Consequently, in August 2003 Mr. Ewango was awarded a Christiansen Fund Fellowship to study Tropical Botany at the University of Missouri in St. Louis in the USA. By 2006 he had earned his Master’s Degree, and by 2010, his doctorate, from Wageningen University in the Netherlands. Dr. Ewango currently is the director of the Okapi Wildlife Reserve which comprises approximately one third of Ituri forest. He also is part of a group that has been designated by the International Union for the Conservation of Nature to develop an ecosystem management plan for the DRC. In addition, he has worked on the publication Flore d’Afrique Centrale (Plants of Central Africa) and the herbarium he constructed at the Okapi Faunal Reserve has become a training and research center for tropical botany and conservation. Dr. Ewango has received numerous awards in recognition of his outstanding conservation efforts. In 2005 he received the Goldman Environmental Prize. He used the prize money to build a new herbarium for the protected area. 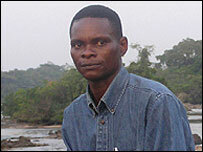 In 2007 Dr. Ewango was invited to give a TED talk and in 2011 he won the Future for Nature Award, which recognizes outstanding international species protection efforts and includes a prize of €50,000 (around $73,000).